We get the entire spectrum of bedroom design requests. We've done rooms in every design style - rooms with drama and bold, bright color to minimalist rooms in monochromatic palettes, and everything in between. While we definitely have our own personal favorites, we love seeing the diversity and the differences in customer tastes and personal styles. Here are 3 new bedroom projects we just completed, each in a very different style but all 3 of them with the same $5,000 budget. While the designers each had to make splurge-and-save choices, all of them maximized the impact of the budget they were given, which is, in the end, the best design outcome one could ask for. 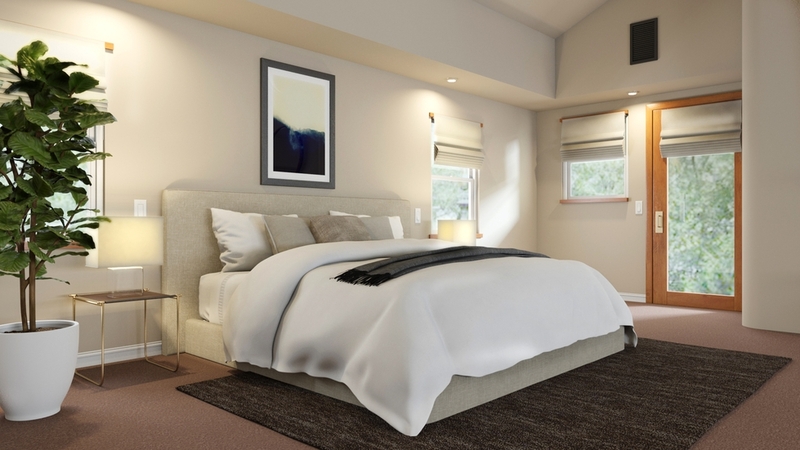 Every bedroom shown here is a photorealistic 3D rendering of a final bedroom design, a new feature we launched so that you can see exactly what your room will look like before you buy any furniture or accessories. 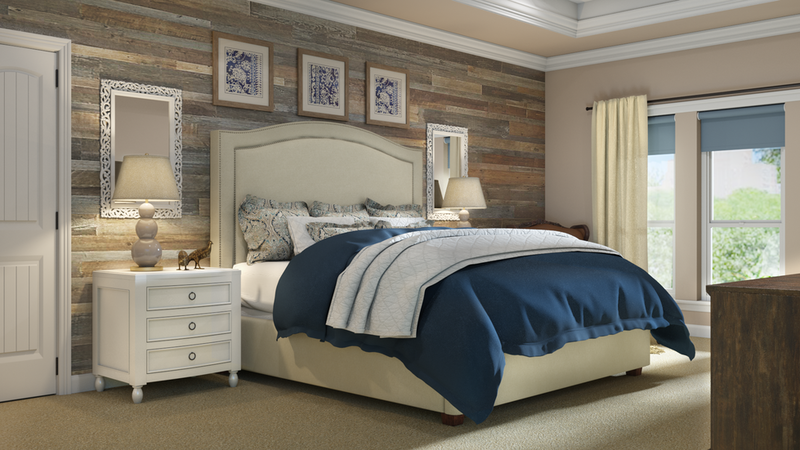 Learn more about requesting a 3D rendering with your next project - no more furniture purchase regrets! This bedroom is perhaps not what you'd immediately picture when you hear "masculine bedroom" but that's exactly why we love this design. Without using any of the more common and expected design elements, Decorist Elite designer Lauren Martin created a room that complemented the modern architectural details of the space. She used a subtle and muted natural color palette, with touches of rich and luxe materials in darker hues for visual interest. As an added layer, she included soft reflective or metallic accents to take advantage of the abundant natural light. Soothing, calming and nuanced, it's the small details that warm this room - while it may be minimalist, it doesn't feel empty or cold. See more of Lauren's design portfolio or, to work with Lauren, start a project and request Lauren as your designer. One of the best things about working with a designer is the back-and-forth dynamic of the design process. Our client for the bedroom below wanted a traditional bedroom but midway through the process, she threw out an idea of a wood feature wall to Decorist Classic designer Jenna Gaidusek, not knowing how or if it would work. Jenna, however, immediately loved the idea and was determined to find a way to include it in her design. The result? A bold and unexpected wood feature wall, from an innovative peel-and-stick product, that fit in perfectly with the client's requested color palette of muted indigo and khaki linen neutrals. See more of Jenna's design portfolio or, to work with Jenna, start a project and request Jenna as your designer. Our client's "before" bedroom was not a space that gave her a feeling of relaxation and escape - the matching-set was furniture outdated and overly ornate, and multiple attempts at freshening up the space over the years had resulted in mismatched pillows and cluttered accessories. 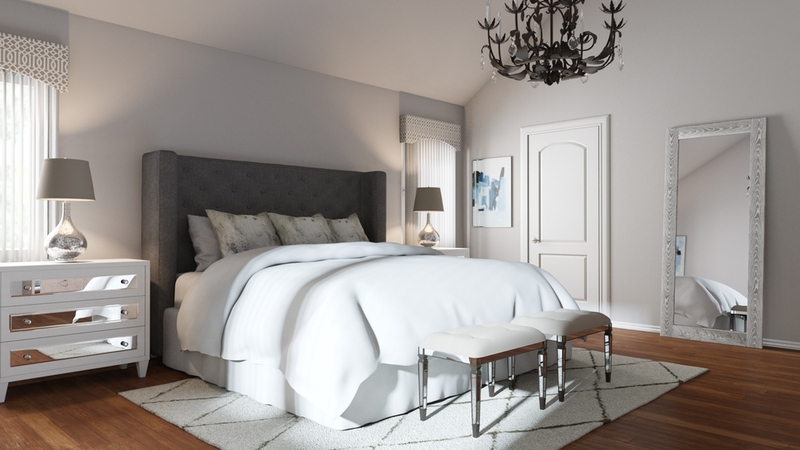 For her "after" bedroom, our client asked Decorist Classic designer JLA Designs to go in the opposite direction: uncluttered but still lush and cozy, glam but with a sophisticated palette of white and gray. Using a mix of styles, Jodi of JLA Designs, brought in a carefully curated selection of items to bring texture and depth to the room without the visual clutter. Escape, achieved. See more of JLA Designs' design portfolio or, to work with JLA Designs, start a project and request JLA Designs as your designer.